I’m sure you’ve all decided to be traditional like me, and are whipping up some corned beef and cabbage in celebration! If that’s the case, you’re about to be left with a whole bunch of leftover corned beef. While very delicious on its own, I’ve got a way to make it even better. Yes, it’s possible. 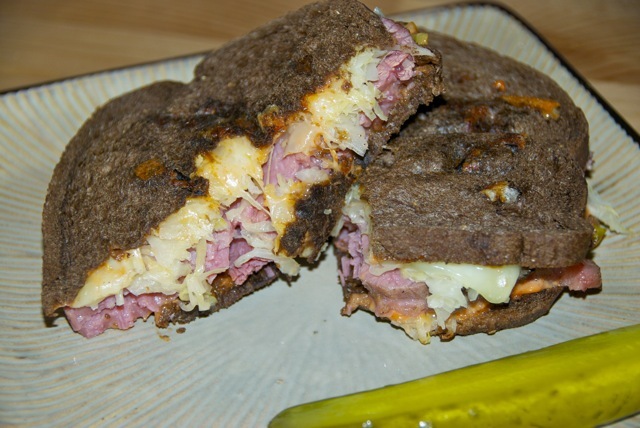 Reubens are one of my top 2 favorite sandwiches. It’s a tie between a Reuben and a Cuban. 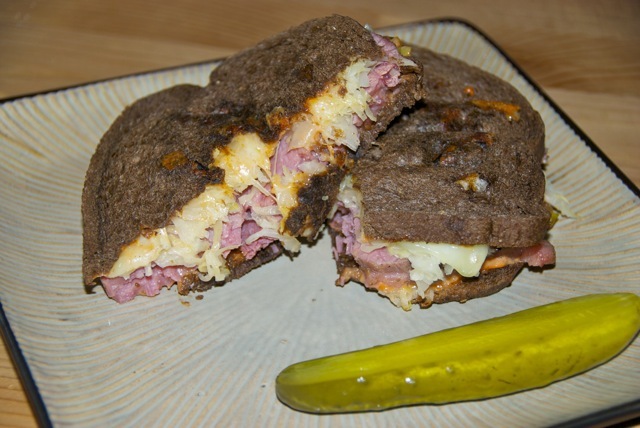 A restaurant in Boston I used to frequent had a sandwich called the Cuban Reuben which incorporated the best parts of both sandwiches. It was pretty much amazing. 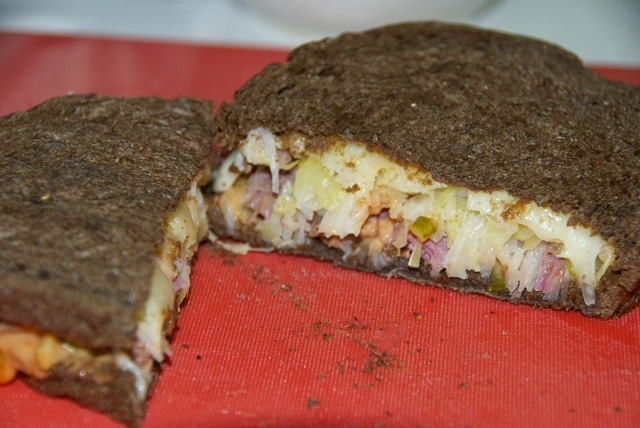 Anyhow, I was super excited to make Reubens. 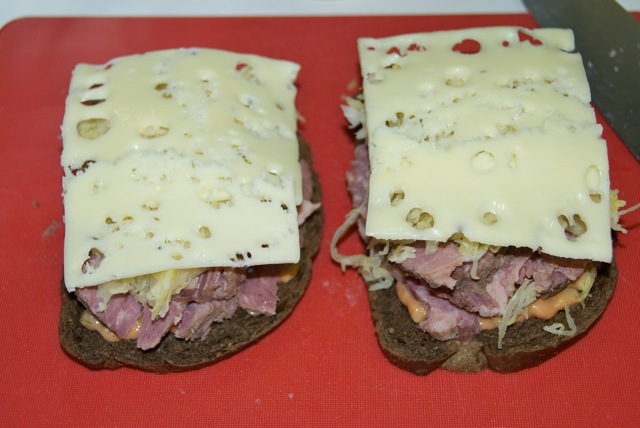 I’ve made turkey Reubens and portobello mushroom Reubens before, but I’ve never made corned beef before, so I’ve never had the opportunity to make a classic Reuben. Until now. 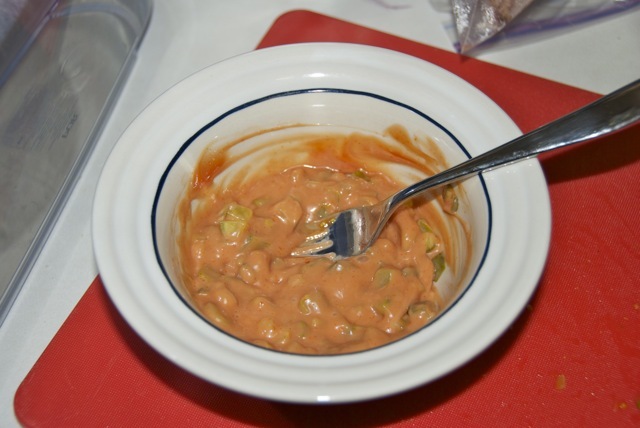 I didn’t have any 1000 island dressing, so I decided to make my own. 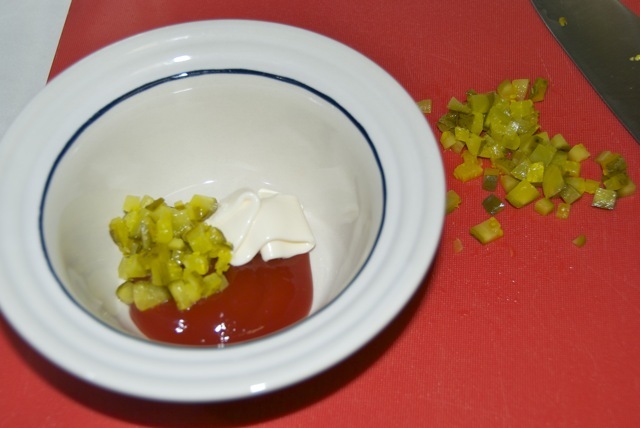 I just mixed chopped pickles (you could also use relish), ketchup and mayo. Adjust the amounts to taste. I used slightly more ketchup than mayo. Now for the sandwiches. Like fall fashion, it’s all about layering. Then a nice healthy slather of dressing. Now the corned beef. The amount you put in is totally up to you. If you look carefully through the pictures, you’ll see the sandwich on the right slowly gets bigger and bigger until it outgrows the sandwhich on the left. Guess whose is whose? Next comes the saurkraut. I squeezed it out really well in paper towels. No soggy sandwiches for me! Next comes some holey moley swiss cheese. 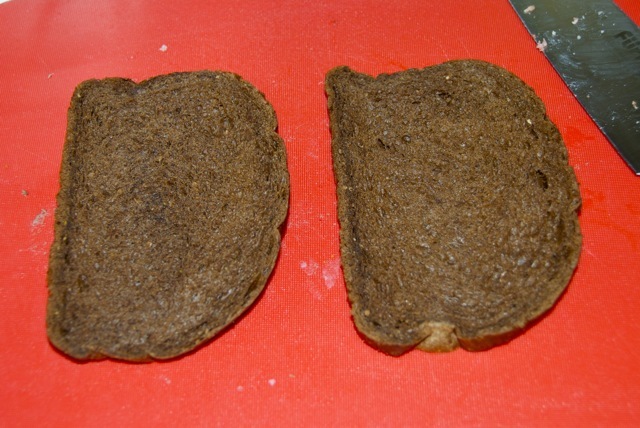 And finally, the last slice of bread, and into the George Foreman they go. 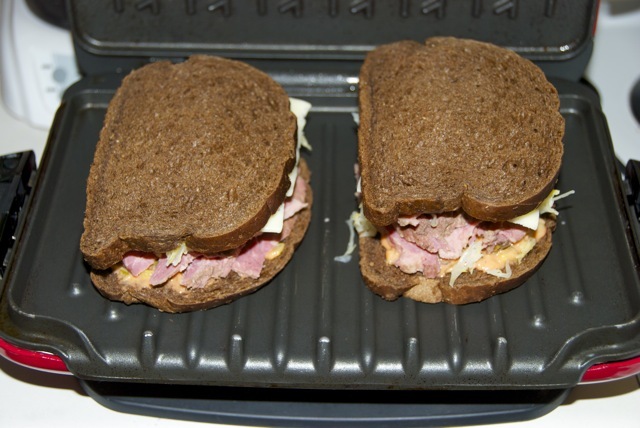 You could also use a panini press, or a good ole skillet, with something heavy on top to press the sandwiches. 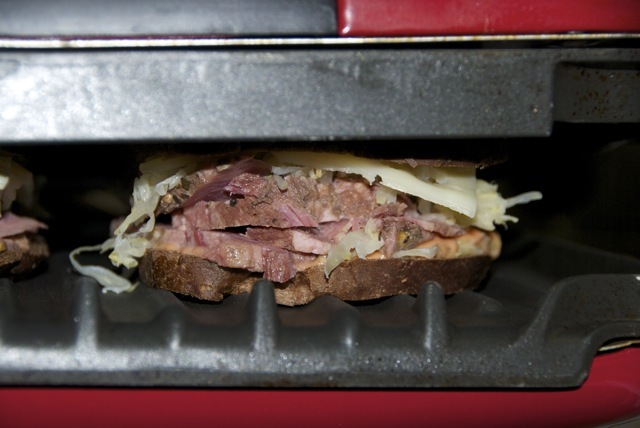 Grill until the cheese is melty and the bread is toasty. Then cut into your wonderful masterpiece. 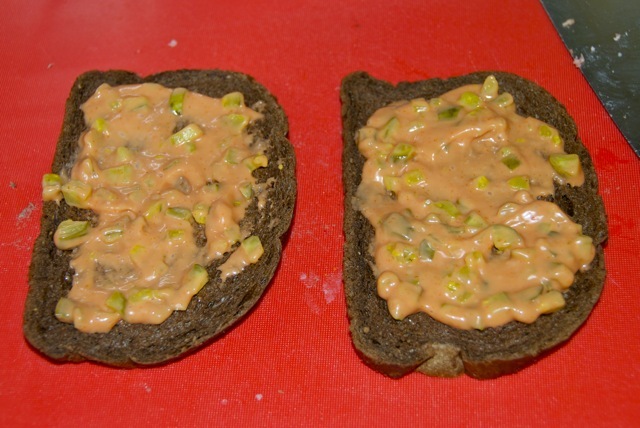 Serve with a neon green pickle! These were SO GOOD. 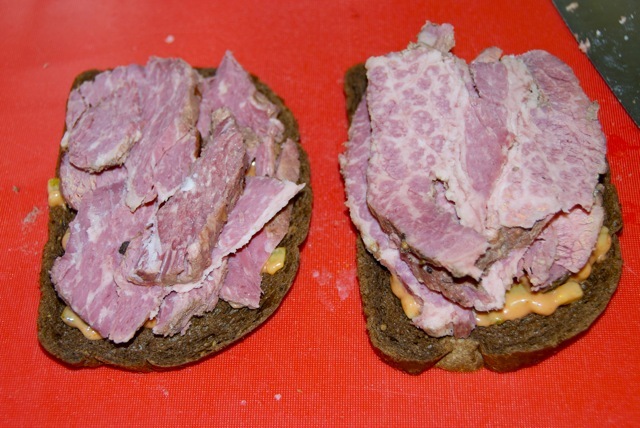 I’m making another corned beef, just so I can make these sandwiches again. Nick said it was the best Reuben he’s ever had, which is saying something, cuz I know I’ve had some pretty amazing restaurant Reubens before. 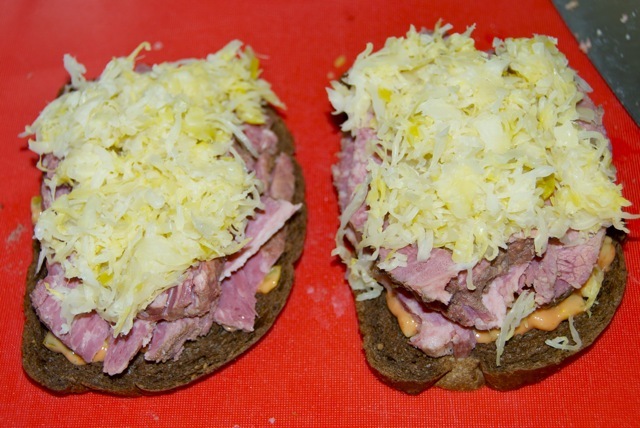 If you have leftover corned beef, you’ve gotta make these. 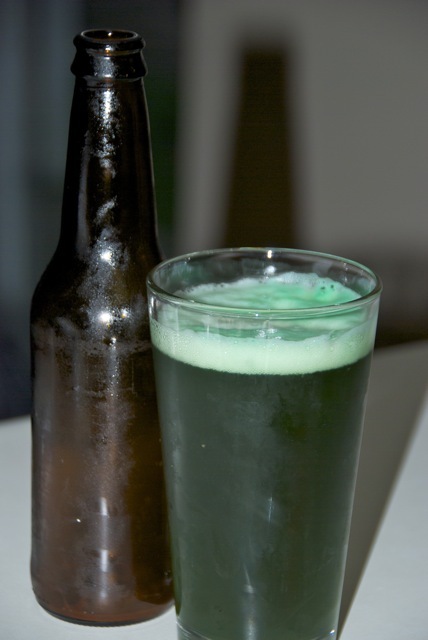 And don’t forget to make my green mint chocolate chip cookies for dessert tonight! Cheers!